Too Rich and Too Big? Three Sarasota mansions—each one the talk of the town—signal a return to the Beaux Arts style of 100 years ago. For more than a century, Florida has been famous for its mansions. Attracted by tropical weather and year-round recreation, the world’s wealthy have flocked here to build elaborate homes dedicated to pleasure, entertaining, and celebrating the lack of a state income tax. And for the past 20 years or so, all that building has been in one style and one style only—Spanish Mediterranean. It was a perfect choice. The red tile roofs and the arched loggias were right at home in the lush, sunny landscape. Better yet, the style was endlessly adaptable. It worked for trophy homes on Longboat Key as well as paired villas in Lakewood Ranch. There was only one problem. After a while it became numbingly familiar. Now, out of the blue, comes something different. Three Sarasota mansions—each one the talk of the town—signal a return to the Beaux Arts style of 100 years ago. There is nothing Spanish or Mediterranean about them. They would be much more at home in the Newport, Rhode Island, of the Vanderbilts and Astors. The Beaux Arts style—along with its many subdivisions—was the emblematic look of what Mark Twain called the Gilded Age. From the 1870s until the mid-1920s, as America’s wealth increased tremendously, a new look took over, one perfect for the ostentatious display of riches. Its roots were in the classical architecture of ancient Greece and the highly decorated style of France in the reign of Louis XIV. In fact, virtually all Beaux Arts buildings are descendants in one way or another of the palaces at Versailles and/or the Parthenon. Beaux Arts is a tricky and often controversial style. Its success depends on a certain amount of excess. It’s designed to impress and was often used for post offices, university halls, museums and train stations. But while a grand train station can promote civic pride, a grand Beaux Arts house provokes more complicated reactions. Take, for example, the “Ask Gary” house on Siesta Key. It is being constructed by chiropractor Gary Kompothecras and his wife, Beth. Dr. Kompothecras started the “Ask Gary” legal and medical referral service, which, judging from the house’s 13,562 square feet of living area, which includes seven bedrooms and seven bathrooms, and its beachfront location, must be very lucrative indeed. Everybody has an opinion about the “Ask Gary” house, and most of them are unfavorable. It’s too big, too gaudy, too out of place. Granted, it is a shock to come upon. Driving down a small lane lined with vacation rentals, you turn a corner and your jaw drops. Is it a hotel? An apartment building? A copy of the White House? Actually, the Kompothecras house is an adaptation of Marble House in Newport, R.I., one of the oversized “cottages” of the famous society resort. Built for William K. Vanderbilt by architect Richard Morris Hunt in 1892, it reflects the taste of his wife, Alma, who was educated in France and developed a fondness for its art and culture. It was, in fact, the mansion that started the Beaux Arts craze in Newport. Many of the elements of the style can be seen in the façade of the Kompothecras house. First of all, it is symmetrical and perfectly balanced. The roof is flat, there is a strong pediment, the entrance is grand, and classical architectural details are used extensively. A curved drive, lined with a balustrade, directs arriving traffic to the elaborate portico. The side of the house that faces the beach is particularly interesting. Once again, it is perfectly symmetrical and echoes Marble House, with a shallow U shape. Why the hostility? True, the setting isn’t quite right. The size and scale of the house demand a plot of several acres, with landscaping that softens the transition between the mansion and its neighbors. But the real problem has nothing to do with architecture. It has to do with what the architecture represents. It brings up so many hot-button issues facing the country: the increasing divide between the super-rich and those who are struggling to survive, the burning resentment that so many people feel about what the real estate crisis has done to their lives, the braggadocio and perceived insensitivity it takes to build such a house. All this overshadows any appreciation for what is a fascinating and unique piece of architecture. Our second Beaux Arts mansion has a much better location, well-suited to its grandeur. It is one of a string of palatial homes that dot Bay Shore Road in the Indian Beach neighborhood. The house belongs to the Second Empire subdivision of the Beaux Arts school, meaning it features the motifs of French architecture during the reign of Napoleon III (1852-1870). Much of what we think of when we picture Paris is built in this style—the opera, the Louvre, the Élysée Palace. There is a rectagonal tower in the center, flanked by two matching towers, with mansard roofs topped with iron trim, including a decorative lightning rod. The elaborate entrance is framed by columns topped with round windows. The principal windows above the entrance are arched, but one misses the elaborate divisions a stricter version of the style would have. And while the center of the façade is impressive, the two wings on each side are a little simpler and more ordinary. For all its Parisian grandeur, the Bay Shore Road house has a bit of an old-fashioned Midwestern flavor to it. The style was particularly popular in the heartland of the United States in the years following the Civil War (it is occasionally referred to as the “General Grant style”) and was often used in county courthouses and hospitals. In fact, the largest building under one roof in the entire country (not counting the very Beaux Arts Pentagon) is done in the Second Empire style: the Ohio State Asylum for the Insane in Columbus. And it may look familiar for another reason. It’s the style of choice for iconic haunted mansions: the Addams Family home, the Disney World thrill rides. Beaux Arts houses are more than homes. They are designed as environments for social rituals and celebrations. It’s no wonder that many of the surviving examples are in great demand as wedding venues. You enter via an elaborate drive to a grand entrance, and prepare for a progression of experiences. It’s all about movement—toward, around, and through. Each space, each room is different, and you and your guests move from one to another, often in a literal procession. There’s a grand hall, along with a dining room, a library or billiard room where the men can retreat, plus wide terraces for a breath of fresh air or from which to watch the fireworks display. The name Beaux Arts, meaning “fine arts,” comes from the École des Beaux-Arts in Paris, where most of these architects studied. It was a rigorous formal training in which the classicism of the past was paramount; the new and experimental were not part of the curriculum. There is nothing intuitive or organic about Beaux Arts. It’s total artifice, and it requires a vast amount of knowledge to get it right. The home of former Congresswoman Katherine Harris. Former Congresswoman Katherine Harris has been learning this firsthand during the construction of the immense home (complete with 11 bathrooms) she and her late husband Anders Ebbeson built near Harbor Acres. 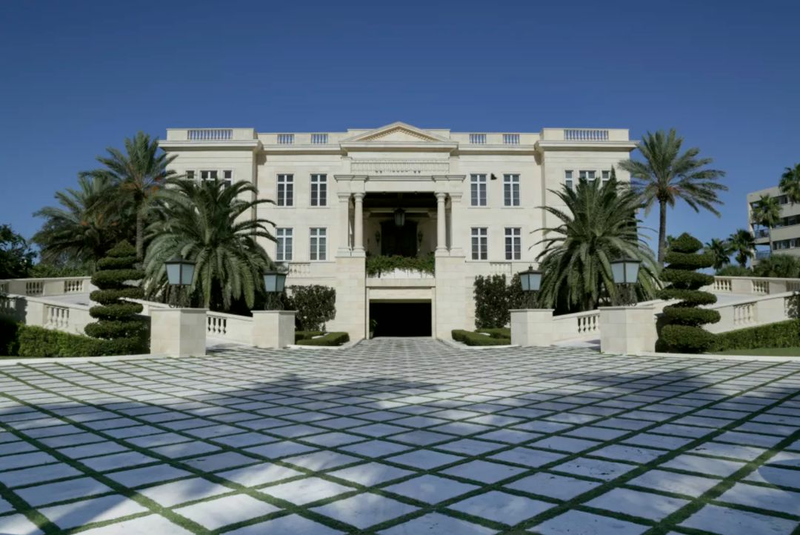 Harris is a Francophile—often spending Christmas in Paris—and the home is the most successful of the new Sarasota mansions. Harris has been telling friends about her endless research to get all the details right, including bicycling around Paris, looking at doorknobs, trying to find the perfect kind. The result is perhaps the most interesting house to be built in Sarasota since the Cà d’Zan. The Harris mansion is based on the Hotel Biron in Paris, built in 1730 and now the home of the Rodin Museum. It is one of the great buildings of the city, a hôtel particulier—meaning it is freestanding, without other buildings attached to the sides. 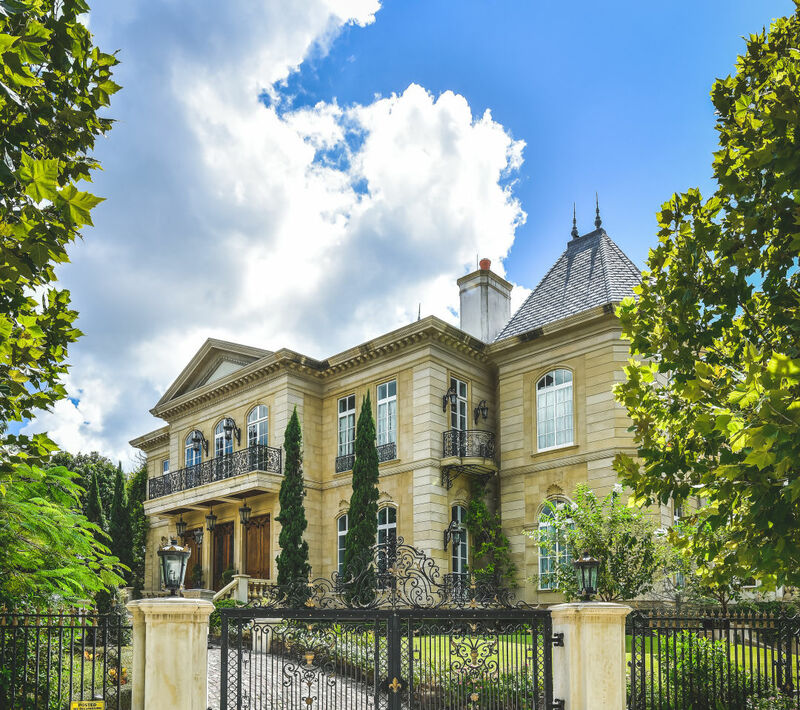 The façade of the Sarasota version matches the Paris original to a remarkable degree. They are both absolutely symmetrical, with two levels and a tower on each side. The windows on the lower level match those on the upper level, with three in the center, two in the middle section, and one in the tower. The result is an unusually pleasing visual harmony, marred only slightly by the Sarasota version being set at an angle, because of the constraints of the size and shape of the lot. The rear elevation of the Harris home, which faces Sarasota Bay, does not match the Hôtel Biron, but rather explodes in a playful assembly of balconies, windows, terraces and alcoves. Here the house turns “modern,” yet the details—cornices, balustrades, borders, window mullions—all appear to be in the classical French style. Is this convergence of Beaux Arts style a trend? Or is it an unusual coincidence? Will the political and economic problems of the country stop any neo-Beaux Arts movement in its tracks? It’s too early to tell, but the intricate and elaborate finishes of the three new mansions would be very difficult to reproduce on a lesser scale. Beaux Arts has always been a style for the affluent and always will be. And if the past is any clue, these three homes will mellow over time, as will people’s attitudes toward them. In generations to come, they may even take their places as beloved local landmarks. The top two Beaux Arts architects. Richard Morris Hunt (1827-1895). For years Beaux Arts architects were considered uninspired copyists who imitated the grand buildings of Europe. Now architectural historians marvel at the way they manipulated classical forms to create the iconic look of prosperity that defined the Gilded Age. Two names stand out. The man who turned American architecture into the highly respected profession it is today. He was the first American to attend the École des Beaux-Arts in Paris, where he supervised work on the Louvre Museum, being renovated for Napoleon III. Back in the United States, he founded the American Institute of Architects and helped develop courses in architecture for colleges and universities. Through his social connections he built many mansions in New York and Newport, R.I. His most iconic buildings include New York City’s Metropolitan Museum and the Biltmore Estate in North Carolina. Stanford White (1853-1906). A partner in the famed architectural firm of McKim, Mead, and White, White not only designed the Gilded Age, he lived it. A charter member of New York society, he specialized in lavish homes for his wealthy friends. A notorious womanizer, he began an affair with a 16-year-old showgirl named Evelyn Nesbitt. When Evelyn later married millionaire Harry K. Thaw, the mentally unstable Thaw murdered White in a fit of jealousy during a performance of Mamzelle Champagne on the rooftop of Madison Square Garden—a building White designed. The ensuing “trial of the century” came to symbolize the debauchery and lavish excess of the time and figured in E.L. Doctorow’s classic novel Ragtime. The Astor Galleries, Ringling Museum. Originally part of the Astor Mansion on Fifth Avenue, these two rooms were purchased by John Ringling when the residence was demolished in 1926. Beaux Arts interiors recreate an earlier era, and these were inspired by French design during the reign of Louis XIV. The Federal Building, 111 S. Orange Ave.: Built in 1934 as part of Roosevelt’s W. P. A., for years this was Sarasota’s post office. It’s beautifully constructed of coral rock and marble. College Hall, New College Campus. Built in 1926 as the home of Ringling brother Charles, the building has an exterior of pink Georgia marble, and the living room measures 58 by 30 feet. Sold to New College in 1962; now holds some offices and hosts special events.